With 3 Regional titles under its belt, the Restricted combination of Kyogre and Xerneas has most certainly proven to be a force to reckon with in the VGC 2019 Sun Series format. Its strong damage output and how easily the core can put out and even overpower your opponent with Xerneas after setting up and Kyogre's very powerful Rain-boosted Water-type moves. This article will look at why this core is so strong and how to answer and even defeat it. 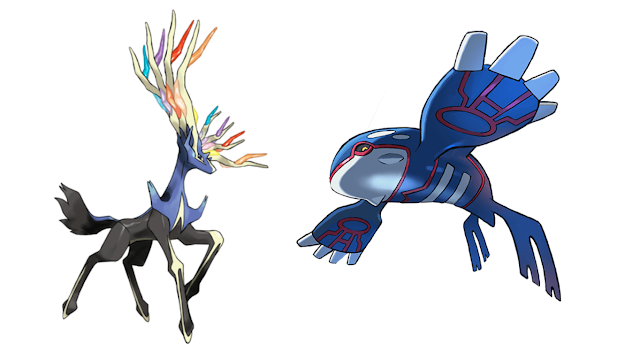 The strength of Xerneas and Kyogre is how strong this duo is able to overpower the opponent. Xerneas can power up through the use of Geomancy while Kyogre's rain-boosted Water-type moves like Water Spout to threaten the Pokémon that can switch into Xerneas hits which is helpful as there aren't very many Pokémon that can switch into both attacks from these restricted Pokémon. While Xerneas builds, in general, are very one-dimensional in how they play, Kyogre builds can be built very differently. Some sets will use a Choice Scarf to outspeed a majority of other Pokémon and use powerful moves like Water Spout to clean through opponents and will pour a majority of their EVs into Sp. Attack and Speed instead of bulk which means these Kyogre won't take that many hits while bulkier variants with pinch berries and even the Choice Specs to take more hits while still dealing out strong damage. These Kyogre variants will pour more EVs into its HP and Defense stats to survive more hits while not being as powerful. The bulkier your Xerneas and Kyogre are, the more reliant they will be on speed control options like Tailwind and Icy Wind. This is because if they invest more bulk, there's a better chance they might take a large amount of damage and will need the speed control from these moves to have a better chance to accomplish there goals, like Xerneas using Geomancy and Kyogre being able to use its moves. This Xerneas set was used by Zach Carlson (@profshroomish) to finish 15th at the 2019 Philadelphia Regionals. In his team report, Zach talks about how he built this set with Chuppa Cross (@ChuppaVGC) and notes some important benchmarks with the EVs. He talks about how it hits 140 speed stat to outspeed Smeargle but decided to hit 143 speed stat to give himself an edge over other Xerneas Zach might fight as well as Timid Kyogre and Jolly Groudon. Max HP is meant to give a defensive advantage over the Timid Xerneas you'll outspeed anyways when trying to set-up with Geomancy. While there's not much investment in Sp. Attack, Zach says it's not noticeable due to how much damage a boosted Xerneas can deal. This Xerneas set was used by Riley Factura (@GENGARboi_) to win the 2019 Portland Regionals. In his team report, Riley talks about how in testing, he wasn't impressed with how bulkier variants aren't dealing enough damage and how faster variants have a better matchup in Xerneas mirrors. Riley talks about how in the 2019 Sun Series format, Xerneas' usual counters like Stakataka, Bronzong, and Ferrothorn have a tough time staying on the field due to how often Xerneas is naturally paired alongside and if the format turns into a lot of Xerneas mirrors, this becomes less effective. Riley ends by thanking Nintendo for creating Solgaleo and Dusk-Mane Necrozma to combat the strength of Xerneas. This Kyogre was used by Justin Burns (@JustMrBurns) to win the 2019 Philadelphia Regionals. Justin's Kyogre represents how early in the format, Choice Scarf Kyogre was running rampant in the format. In his team report, Justin talks about how Choice Scarf Kyogre works very well by exerting immediate pressure the second it hits the field and forces the opponent to deal with it right away. He says how early on, most people used their Scarf Kyogre to just dent their opponent's team but on his team, the team does most of the hard work and ideally, Kyogre and come in and just clean up. Justin says the moveset is very standard apart from Scald which is there to give Kyogre a single target Water-type move that isn't blocked by Wide Guard since he's not a fan of double spread moves on a choice item. He says Scald was originally Hydro Pump but was later changed to Scald since he wasn't a fan of Hydro Pump's shaky 80% accuracy. The bulk is meant to allow his Kyogre to survive Moonblast from boosted Xerneas then dumped into Speed followed by Sp. Attack. This Kyogre was used by Riley Factura (@GENGARboi_) to win the 2019 Portland Regionals. In his team report, Riley talks about he was testing multiple Kyogre variants including both Choice Scarf and bulkier sets, but decided to use this one. On his team, with Tsareena's Queenly Majesty or Tapu Lele's Psychic Terrain to block Fake Out, there would be too many situations where his Kyogre would get punished so he decided to use Protect. The speed stat is meant to outspeed Smeargle and hit 140 Speed stat only required 16 extra EVs, which is insignificant in exchange for outspeeding other Pokémon that will outspeed Smeargle. Riley ends by saying he wasn't a fan of more bulkier variants of Kyogre he tested due to a major decrease in damage because Kyogre's role on teams is to be the team's premier damage dealer so maxing out its Special Attack only makes sense. Tornadus has appeared on every popular Xerneas/Kyogre team mainly due to how Tornadus is able to reliably support Kyogre. Thanks to access to Prankster Tailwind and its main Flying-type attack in Hurricane which threatens the popular Grass-types such as Ludicolo, Amoonguss, and Tsareena that gives Kyogre a lot of trouble. If you see Tornadus and Kyogre, your best bet is to use a Pokémon that can switch into both Tornadus' Flying moves and Kyogre's Water moves to defeat it. Incineroar has access to a few tools that can support both Kyogre and Xerneas. It's access to Fake Out can help Incineroar's partners to do their job, either in Xerneas using Geomancy or Kyogre using one of its attacks. Its main attacking move in Flare Blitz can deal with the Grass-types like Ferrothorn and Kartana Kyogre absolutely hates fighting and can also hit Steel-types like Solgaleo and Bronzong that Xerneas isn't a fan of. Its final tool in its Intimidate ability is great to weaken the power of physical hits like Groudon's Precipice Blades that although Kyogre and Xerneas aren't weak to, can still deal a lot of damage. Amoonguss is very helpful, mainly thanks to its access to Rage Powder to shield its partner from troublesome attacks like Grass moves on Kyogre and Steel moves on Xerneas. For Kyogre, Amoonguss' Grass and Poison typing means it resists both the Electric and Grass-type moves that Kyogre and it can take the Poison and Steel moves that Xerneas is weak to. Tsareena mainly appears on teams where the Kyogre is a Choice Scarf variant, which has been true for most of the 2019 Sun Series format thanks to it's Queenly Majesty ability to block Fake Out to allow Kyogre to use Water Spout. Tsareena also gets access to the move Feint which is great to break your opponent's Protect which can help Kyogre KO that Pokémon, or you can use Feint to break a Focus Sash to help Kyogre pick up a KO it otherwise couldn't. The final notable partner in Kartana is great because of its strength as a physical attacker. Its Grass and Steel typing because in the mirror, Kartana can use the Grass-type Leaf Blade to threaten opposing Kyogre, the Steel-type Smart Strike to threaten opposing Xerneas, and its coverage moves in Sacred Sword to threaten Incineroar and Knock Off to threaten other Pokémon like Solgaleo and Lunala who might give you trouble. Ferrothorn is very interesting, mainly due to how its a very defensive alternative to Kartana. The strength of Ferrothorn is how its able to take hits from both Kyogre and Xerneas and use its STAB moves in Power Whip to threaten Kyogre and Gyro Ball to threaten Xerneas. If you use Ferrothorn, you'll need to find a way to deal with Incineroar and Kartana which if you can do this, your Ferrothorn will be in a very solid position. Heliolisk is a very niche Pokémon due to how it can threaten the Kyogre + Tornadus version of the team. Thanks to its Dry Skin ability, Heliolisk can switch into Kyogre's Water-type moves and even regain HP in the rain. It can also switch into Tornadus' Flying-type moves and threaten both with its Electric-type moves like Thunderbolt and Thunder. Heliolisk will have to worry about Incineroar's Fire-type moves that because of Dry Skin, it essentially becomes weak to it, as well Kartana's Fighting-type moves that it's weak to the sheer power of Xerneas' attacks. Kyogre + Xerneas has proven to be the strongest restricted duo in the VGC 2019 Sun Series format and for good reason. Its ability to overpower the opponent is very strong and both in practice and in reality, this has very much been proven to be true with 3 Regional titles and a 2nd Place finish at an International Championship. The next question is in the Moon Series with the introduction of Z-moves and how many players are very interested in the power of Waterium-Z Kyogre, will this duo prove to be as strong as it is in Sun Series, or will it get even scarier. Only time will tell and we'll most likely know very early in the Moon Series how true this is or will a different restricted core take its place as the one to fear.